Piero Consoli at MC Yacht Brokers tells me there'll be an Open Day aboard the 24m sailing yacht Aori at the Monaco Yacht Club on July 13th and 14th between 3pm and 6pm. 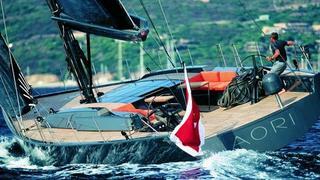 Aori is a canting keel, three-cabin version of the Wally 80. The keel can be canted up to 35° each side by the push-button system located with the sail trimming controls on the Wally designed helm stations, improving performance and enhancing comfort. The cruising configuration provides for a self-tacking jib, while a 110% battened jib can be used in light airs and racing. The saloon of Aori is flooded with natural light coming from the wide skylight, while the spacious social cockpit features two tables for comfortable al fresco dining. The interior styling combines white lacquered cabinets and ceiling with oak wood, black carbon fibre soles and orange upholstery. Aori is asking €3.3 million.